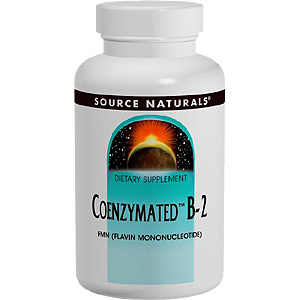 Flavin mononucleotide (FMN) is involved in a wide array of enzymes and has many roles in producing energy from our food, as well as in bioconverting B-6 to its coenzyme form. FMN is converted in the body into flavin adenine dinucleotide (FAD), another coenzyme, which is responsible for regenerating the important antioxidant glutathione. Coenzymated™ B-2 Sublingual 25mg - 60 tabs, (SOURCE NATURALS) is shipped in a discrete, unmarked package. Orders are processed immediately and usually take about 3 to 5 working days to be received. We do ask that you try it for 2 to 3 weeks to feel the full effects. Any information received is used only for order processing and shipping purposes. Your information, such as e-mail address, will never be disclosed to a third party.